The goal of the United Nations Framework Convention on Climate Change is to stabilize atmospheric CO2 and other greenhouse gases (GHGs) to prevent "dangerous" anthropogenic interference with climate. CO2 is the most important of the anthropogenic GHGs in terms of radiative forcing, and its stabilization presents major challenges to society. To stabilize atmospheric CO2 concentration at any given level, it is necessary to define trajectories of allowable CO2 emissions. This calculation requires a thorough understanding of the carbon cycle—that is, the various terrestrial and oceanic processes that control the amount of CO2 that stays in the atmosphere. Timescales of carbon cycle processes range from months to centuries for carbon exchange between the atmosphere, land biosphere, and ocean to millennia for ocean-sediment interactions. Processes that operate on timescales longer than a few years cannot be investigated by experimental field studies, and long-term instrumental observations are missing for many variables. Paleodata (especially measurements on ice cores, marine and lake sediments, corals, tree rings, and historical documents) provide unique information on the magnitude of natural CO2 variability, the processes regulating atmospheric CO2 and their associated timescales (including multimillennial timescales), and the magnitude of carbon cycle—climate feedbacks. The longest available ice-core records (from Vostok, Antarctica [Petit et al. 1999] and Dome Fuji, Antarctica [Kawamura et al. 2003]) demonstrate that atmospheric CO2 concentration today is higher than at any time during (at least) the past 420,000 years. The search for mechanisms driving the observed glacial-interglacial changes has led to the identification of a range of processes that contribute to the control of atmospheric CO2 concentration and climate. The detection of abrupt, decadal-scale climatic changes influencing large regions has fueled the concern that anthropogenic GHG emissions may trigger future abrupt climate changes. Changes in CO2 and climate during the Holocene, and during the last millennium of the Holocene, are less spectacu lar but provide important information on the linkages between the carbon cycle and climate. The Vostok and Dome Fuji ice-core records reveal that atmospheric CO2 variations over the past four glacial cycles were confined to the range between ~ 180 parts per million (ppm) (around glacial maxima) and ~ 280 ppm (typical for interglacial periods) (Petit et al. 1999; Kawamura et al. 2003). Thus, preindustrial atmospheric CO2 concentrations were consistently lower than today's value of 370 ppm and dramatically lower than the projected concentration range at year 2100 (450 to 1,100 ppm) reported by the Intergovernmental Panel on Climate Change (IPCC) (Joos et al. 2001; Prentice et al. 2001). A success of the greenhouse theory, first established in the 19th century (Arrhenius 1896) and of today's climate models is that both the global warming over the industrial period (Houghton et al. 2001) and the widespread cold conditions of the last glacial maximum (LGM) (Ganopolski et al. 1998; Weaver et al. 1998; Kitoh et al. 2001; Kim et al. 2002; Hewitt et al. 2003; Shin et al. 2003) can be consistently explained by the radiative forcing due to changes in atmospheric GHG content and other factors. Detailed comparison of temperature proxies and CO2 during the last glacial-interglacial transition, however, suggests that Antarctic temperature started to rise before atmospheric CO2 (Figure 7.1). This finding is consistent with the view that natural CO2 variations constitute a feedback in the glacial-interglacial cycle rather than a primary cause (Shackleton 2000). Changes in the Earth's orbit around the Sun are the pacemaker for glacial-interglacial cycles (Hays et al. 1976; Berger 1978), but these rather subtle orbital changes must be amplified by climate feedbacks in order to explain the large differences in global temperature and ice volume, and the relative abruptness of the transitions between glacial and interglacial periods (Berger et al. 1998; Clark et al. 1999). Biogeochemical cycles play an important role for the amplification of orbital changes. Model simulations suggest that the direct radiative forcing by atmospheric CO2 and CH4 concentrations may have contributed up to half of the observed glacial-interglacial surface temperature difference at a global scale (Broccoli and Manabe 1987; Gallee et al. 1992; Shin et al. 2003). Other major factors involved in maintaining cold conditions during glacial periods include the water vapor feedback, the high albedo of the continental ice sheets (Broccoli and Manabe 1987; Hewitt and Mitchell 1997), the high albedo (especially when snow covered) of extensive nonforested regions at high latitudes (Gallee et al. 1992; Levis et al. 1999; Yoshimori et al. 2001; Wyputta and McAvaney 2002), and the reflection of shortwave radiation by the greatly enhanced atmospheric content of mineral dust (Claquin et al. 2003)—itself a consequence of reduced vegetation cover (Mahowald et al. 1999; Werner et al. 2002). It is plausible that such bio-geochemical and biophysical feedbacks will amplify the direct anthropogenic greenhouse gas forcing, just as they have amplified orbital changes in the past. Figure 7.1. The evolution of proxies for local temperature in Greenland (818O, top line) and Antarctica (8D, dash) and the atmospheric concentration of the two greenhouse gases CO2 (dots) and CH4 (diamonds) over the last glacial-interglacial transition (Monnin et al. 2001). The records of Antarctic temperature and atmospheric CO2 are highly correlated and can be divided into four phases as indicated by dashed vertical lines. The rapid (decadal-scale) variations in CH4 at the beginning of the B0lling/Aller0d (B/A) and at the beginning and end of the Younger Dryas (YD) are coeval with abrupt temperature changes in the North Atlantic region. Temperature changes in Antarctica are smaller and less abrupt than in Greenland, and temperature changes in Greenland and Antarctica are asynchronous. Measurements are from the EPICA ice core drilled at Dome Concordia, Antarctica, and from the GRIP ice core drilled at Summit, Greenland. The timescales of both cores have been synchronized to the GRIP scale. The Earth's orbit around the Sun can be calculated with high precision for the future as well as the past (Berger 1978; Berger and Loutre 1991). Future climate changes can therefore be forecast on a multimillenial time scale with some confidence. Even under a natural CO2 regime (i.e., with the global temperature-CO2 correlation continuing as in the Vostok ice core), the next glacial period would not be expected to start within the next 50,000 years (Loutre and Berger 2000; Berger and Loutre 2002). The Holocene will thus last longer than the previous (Eemian) interglacial, which endured for only about 10,000 years. This difference is because orbital eccentricity was much higher in the Eemian than today. With low orbital eccentricity, the effects of precession are minimized, and extreme cold-northern-summer orbital configurations like that of the last glacial initiation at 115 kilo years before present (ka BP) do not occur. Sustained high atmospheric greenhouse concentrations, comparable to a mid-range CO2 stabilization scenario, may lead to a complete melting of the Greenland ice cap (Church et al. 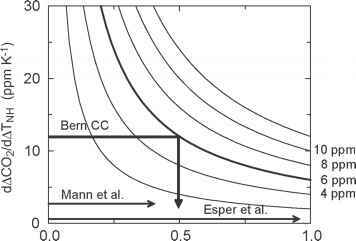 2001) and further delay the onset of the next glacial period (Loutre and Berger 2000). berger et al. 2002). Similarly, substantial changes in CO2 occurred during the LGM-Holocene transition after the high fluxes disappeared (Rothlisberger et al. 2002). The initial slow CO2 decline during the first part of the last glacial requires a different explanation, possibly involving ocean-sediment interaction with a timescale of millennia (Archer et al. 1999). The subsequent lowering of atmospheric CO2 by a further ~ 30 ppm occurred more rapidly, coeval with the increase of Antarctic dust. Recent analysis of dust-storm data has shown that the natural component of the contemporary dust loading in the atmosphere does exceed 75 percent (Tegen et al. 2003), although a substantial fraction of the contemporary dust was formerly attributed to human activities such as overgrazing and construction (Tegen and Fung 1995). Future dust supply to the Southern Ocean and other high-nutrient low-chlorophyll regions could change through changes in vegetation cover and surface characteristics in response to changes in climate, atmospheric CO2, and land use activities or through changes in atmospheric transport. The resulting changes in marine iron supply could provide a small feedback to increasing atmospheric CO2. Greenland ice-core records show abrupt, decadal-scale temperature changes locally of up to 16 K amplitude (Schwander et al. 1997; Severinghaus et al. 1998; Lang et al. 1999; Severinghaus and Brook 1999) during the last glacial period and the transition to the present interglacial. These are known as the Dansgaard Oeschger (D O) events (Dansgaard et al. 1982; Oeschger et al. 1984; Broecker et al. 1985; Clark et al. 2002) (Figure 7.2). Isotopic sedimentary and pollen records from lakes and marine sediments (Eicher et al. 1981; Ruddiman and McIntyre 1981; Bond et al. 1993; Yu and Eicher 1998; Ammann et al. 2000; Sánchez Goñi et al. 2000; Baker et al. 2001; Prokopenko et al. 2001; Sánchez Goñi et al. 2002; Tzedakis et al. 2002) and European and Asian loess records (Ding et al. 1999; Ye et al. 2000; Porter 2001; Rousseau et al. 2002) demonstrate that substantial effects of these abrupt climate changes extended over the North Atlantic region and beyond. Concomitant temperature changes recorded in Antarctica are smaller, less abrupt, and asynchronous to the Northern Hemisphere changes (Indermühle et al. 2000). This asynchrony has been explained (Stocker and Johnsen 2003) by a reduction in the North Atlantic Deep Water formation rate and oceanic heat transport into the North Atlantic region (Stocker 2000), a phenomenon that, in combination with the large heat capacity of the Southern Ocean, produces cooling in the North Atlantic and warming in the Southern Hemisphere (Mikolajewicz 1996; Marchal et al. 1999a, b). Figure 7.2. The evolution of atmospheric CO2 concentration and Greenland and Antarctic temperature as indicated by S18O, during the period from 70 ka BP to 20 ka BP (Indermuhle et al. 2000). 818O values are from ice drilled at Summit during the Greenland Ice Core Project (GRIP) and Vostok, Antarctica, and CO2 data are from Taylor Dome, Antarctica. All data are plotted on the GT4 chronology of Vostok. Dansgaard/Oeschger events 2 to 18 (warm interstadials in the Greenland S18O record), the Heinrich events H2 to H6 (filled triangles), recorded as ice-rafted debris in marine sediments in the North Atlantic, and the Antarctic warm periods A1 to A4 are indicated. The GRIP, Vostok, and Taylor Dome ice cores were synchronized based on methane measurements. The location of Heinrich events is based on the synchronization of the GRIP ice core to North Atlantic deep sea cores (Bond and Lotti 1995). The timescale is tentative for the first part of the record indicated by light gray in the S18O curve. for a collapse of the thermohaline circulation (THC) as the meltwater input into the North Atlantic stabilizes the water column. Benthic carbon-isotope (Sarnthein et al. 1994) suggests that the deep Atlantic Ocean during the cold periods was filled with nutrient-rich water of Southern Hemisphere origin, and the atmospheric records of 14C and 10Be suggest that the ocean's ventilation was slowed (Hughen et al. 2000; Muscheler et al. 2000; Marchal et al. 2001). A plausible explanation for the observed changes is the following sequence (Schmittner et al. 2002): Ice accumulates during the interstadial warm phases on the Laurentide ice sheet; this leads to an instability, triggering a massive iceberg discharge into the North Atlantic; the freshwater input causes a temporary breakdown of the THC, with cooling in the north and warming in the south; finally the THC resumes, perhaps in response to slow climatic changes in the Southern Ocean (Knorr and Lohmann 2003), when the freshwater perturbation has dissipated. This mechanism has been questioned by a high-resolution ice-core record that shows that the Antarctic cold reversal may have started earlier than the B0lling/Aller0d (B/A) warming (Morgan et al. 2002), implying that the Antarctic cooling was not caused by the restarting of the THC in the Northern Hemisphere and thus suggesting a more important role for the tropics and Southern Hemisphere in controlling abrupt climate changes. A precise determination of hemispheric temperature relationships from the isotopic signatures in ice, however, remains challenging, as factors other than temperature, such as changes in the season-ality of precipitation, can affect the isotopic composition of the ice, and noise in the records may bias results. Most current climate models, when forced with scenarios of increasing GHG concentrations, show a decrease in the THC and a reduction in the poleward heat transport by the North Atlantic (Cubasch et al. 2001). Idealized model simulations also suggest that the THC is subject to instabilities (as the palaeodata confirm) and that the North Atlantic Deep Water formation might collapse in a warming world (Bryan 1986; Stocker and Schmittner 1997) and remain in a collapsed state, owing to hysteresis, for many centuries. Unfortunately, the existence of critical thresholds and nonlinearities seriously limits our ability to predict the behavior of the THC (Knutti and Stocker 2002). Long-term ocean monitoring may be necessary if we are to reliably detect changes in the THC. Tracers related to the carbon cycle, such as dissolved O2, are sensitive to circulation changes. Available observations suggest a decreasing inventory of dissolved O2 in the ocean comparable to that predicted by modeling the effects of global warming on the ocean circulation (Plattner et al. 2001, 2002; Bopp et al. 2002). This effect is also present as an increase in atmospheric O2 concentration, requiring a correction to the land-atmosphere partitioning of anthropogenic CO2 (Bopp et al. 2002; Keeling and Garcia 2002; Plattner et al. 2002), estimated from observed atmospheric CO2 and O2 trends (Keeling and Shertz 1992; Prentice et al. 2001). An extended monitoring of dissolved O2 has been proposed to detect changes in ocean circulation and to improve estimates of the carbon sinks (Joos et al. 2003b). Despite the large fluctuations in climate, atmospheric CO2 varied less than 20 ppm during the large Dansgaard/Oeschger events associated with Heinrich events and less than 10 ppm during the smaller Dansgaard/Oeschger events (Figure 7.2) (Stauffer et al. 1998; Indermühle et al. 2000). CO2 variations were ~ 30 ppm around the Younger Dryas (YD) cold interval (Figure 7.1), during which the North Atlantic THC was greatly reduced (Sarnthein et al. 1994). Concomitant changes in methane and in N2O were about 100—200 ppb and ~30 ppb, respectively. Ocean model simulations reproduce the observed behavior of the coupled carbon-climate system during abrupt events of this type. Thus, when the North Atlantic THC is forced to collapse by imposing a meltwa-ter pulse in an ocean model, the simulated consequences include a small (10 ppm) temporary increase in atmospheric CO2, strong cooling in the North Atlantic region, a slight warming in the Southern Hemisphere, an increase in nutrient-rich water in the Atlantic, higher 14C/12C ratios in the atmosphere (Marchal et al. 1999a, b; Delaygue et al. 2003), and a 10 parts per billion (ppb) reduction in atmospheric N2O (Goldstein et al. 2003), that is, about a third of the observed N2O changes (Flückiger et al. 1999). Similarly, a relatively small positive feedback between atmospheric CO2 and ocean circulation changes is found in global warming simulations in which the rate of North Atlantic Deep Water formation is reduced or even collapsed (Joos et al. 1999; Plattner et al. 2001). Thus, paleodata and model simulations agree that possible future changes in the North Atlantic Deep Water formation rate would have only modest effects on atmospheric CO2. This finding does not, however, preclude the possibility that circulation changes in other ocean regions, in particular in the Southern Ocean, could have a larger impact on atmospheric CO2 (Greenblatt and Sarmiento, Chapter 13, this volume). This analysis does not consider the possible contribution of vegetation dieback to atmospheric CO2. Vegetation dieback may have contributed to the observed changes in atmospheric CO2 concentration during the YD and the Dansgaard/Oeschger events (Scholze et al. 2003) and could have larger effects if an abrupt collapse of the North Atlantic THC occurred during a warm-climate regime. Figure 7.3. Holocene variations in atmospheric CO2 concentration, from measurements on air entrapped in ice from Taylor Dome, Antarctica (Indermühle et al. 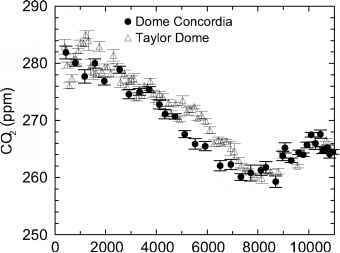 1999) and from Dome Concordia (Flückiger et al. 2002). The difference between the two cores, notably between 4 and 8 kyr, is most likely due to uncertainties in the age scales of the two cores (Stauffer et al. 2002). restrial organic carbon (Indermühle et al. 1999). An alternative explanation (Broecker et al. 2001; Broecker and Clark 2003) is that the steady CO2 rise after 8 ka is due to the CaCO3 compensation mechanism, responding to the earlier extraction of carbon from the atmosphere by terrestrial uptake during the period after the LGM. This mechanism depends on ocean-sediment interactions and has an appropriately long time constants of 5 ka and longer (Archer et al. 1999). Unfortunately, uncertainties in the existing ice core ô13C (Indermühle et al. 1999) and marine sediment data (Broecker and Clark 2003) do not allow us to discriminate reliably between the two hypotheses based on observations alone. Other information sources provide circumstantial evidence. The benthic carbon isotope record (Curry et al. 1988; Duplessy et al. 1988) constrains the terrestrial uptake during the last glacial-interglacial transition and, hence, constrains the contribution by the CaCO3 compensation mechanism to within 4 to 10 ppm (Joos et al. 2003a). Simulations with land biosphere models (François et al. 1999; Brovkin et al. 2002; Joos et al. 2003a; Kaplan et al. 2002) and pollen-based estimates (Adams and Faure 1998) yield ambiguous results ranging from a terrestrial release of 90 PgC to an uptake of 130 PgC during the late Holocene. The Lund-Potsdam-Jena (LPJ) dynamic global vegetation model (Sitch et al. 2003) coupled to the atmosphere-ocean-sediment carbon cycle component of the Bern CC model has been used to compare the conflicting explanations for the Holocene CO2 rise (Joos et al. 2003a). The model was forced with a 21 ka—long time series of "snapshot" simulations from the Hadley Center climate model (Kaplan et al. 2002) or the NCAR climate model and reconstructed atmospheric CO2 (Monnin et al. 2001) during the transition until 11 ka BP. Afterward, atmospheric CO2 was simulated. The entire Holocene ice-core CO2 record is matched within a few ppm. A sensitivity analysis in combination with available observations suggests that CaCO3 compensation, sea surface warming, and a terrestrial release, in response to land use and desertification, contributed about equally to the observed 20 ppm rise after 8 ka BP. The modeled CO2 decrease during the early Holocene is, in agreement with earlier suggestions, mainly due to the establishment of boreal forest in formerly glaciated areas, partly compensated for by CaCO3 compensation. Simulated LGM-Holocene terrestrial uptake is 800 PgC, slightly higher than the 300 to 700 PgC range derived from the benthic isotope record. These simulations took into account the dynamic land area changes caused by sea-level rise and ice retreat. Carbon sequestration by regrowth and soil establishment on formerly ice-covered areas is almost compensated for by carbon loss in response to sea-level rise and climate change on areas that were ice-free at the LGM. Increasing carbon storage on land in these simulations was principally a consequence of climate change (forced by orbital variations, CO2, and ice extent), in combination with direct physiological effects of rising CO2 concentration on plant productivity and water-use efficiency. These direct CO2 effects were responsible for more than 80 percent of the simulated difference in global carbon storage between the Holocene and the LGM. Existing uncertainties in the ice-core 813C and marine sediment records need to be reduced to further constrain the quantitative contributions of individual mechanisms to the Holocene CO2 variations. Nevertheless, the observed Holocene CO2 variations, combined with marine benthic 813C data (Shackleton 1977; Curry et al. 1988; Dup-lessy et al. 1988) are consistent with the timescale inferred for ocean-sediment interactions (Archer et al. 1999), and with a role for CO2 fertilization in determining terrestrial carbon storage at concentrations of CO2 within the natural range (180-280 ppm) (Esser and Lautenschlager 1994; Peng et al. 1998; Bennett and Willis 2000). One implication for the future evolution of atmospheric CO2 is that the CaCO3 compensation mechanism, which added CO2 to the atmosphere during the preindustrial Holocene, will similarly remove atmospheric CO2 emitted by human activities, but the timescale for this removal will be very long (multimillennia). The carbon sink mechanism due to CO2 fertilization has additional experimental support for higher than present CO2 concentrations (DeLucia et al. 1999; Luo et al. 1999), and is already accounted for in CO2 stabilization scenario calculations (Joos et al. 2001; Prentice et al. 2001). Knowledge of natural climate variability and of the role of solar and volcanic forcing is important for the attribution of climate change during recent decades and centuries. Different reconstructions of forcing by past solar irradiance variations, however, based on cosmogenic isotopes (14C, 10Be, 36Cl; Beer et al. 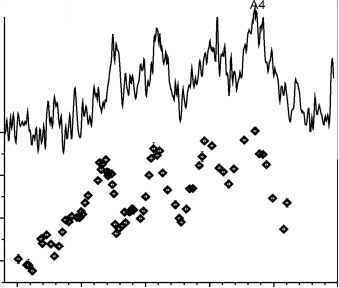 1994) and sunspot numbers (Hoyt and Schatten 1994) vary by up to a factor of five (Lean et al. 1995; Reid 1997; Bard et al. 2000; Crowley 2000). In addition, there is a growing literature arguing for an amplification of the climate impact of solar irradiance changes through a solar modulation of the cosmic ray flux, affecting, for example, low-level cloud cover on Earth, based on empirical correlations between climate change and solar activity over specific periods (e.g., Tinsley and Deen 1991; Shaviv and Veizer 2003). The proposed correlation, however, breaks down over the last years of the instrumental record, and cosmic ray flux and climate change proxies are unrelated for the period 20 to 60 ka BP, when very large changes in the cosmic ray flux (Laschamp event) occurred (Wagner et al. 2001). The magnitude of Northern Hemisphere surface temperature variations is also debated (Jones et al. 1998; Mann et al. 1999; Briffa 2000; Crowley 2000; Huang et al. 2000; Beltrami 2002; Esper et al. 2002). For example, Esper et al. (2002) report that the decadal-average Northern Hemisphere surface temperature was about 1 K lower in the first half of the 17th century than at around year AD 1000 and the present clima-tological mean, whereas Mann et al. (1999) report that decadal-average temperatures varied within 0.4 K only. Figure 7.4. Relationship between Northern Hemisphere (NH) surface temperature change, climate—carbon cycle feedbacks, and variations in atmospheric CO2. Isolines depict different ranges for CO2 variation during the last millennium and are plotted against changes in decadal-average NH-temperature (horizontal axis) and the climate-carbon cycle feedback expressed as change in atmospheric CO2 concentration per degree change in decadal-average NH surface temperature (vertical axis). The range of NH-temperature variations reconstructed by Mann et al. (1999) and Esper et al. (2002) are shown. The arrow labeled Bern CC depicts the NH temperature change obtained when combining the climate-carbon cycle feedback of the Bern CC-LPJ model (Gerber et al. 2003) with a CO2 variability range of 6 ppm. global mean surface temperature over the 20th century contributed little to the observed CO2 increase over the same period. This data-based finding is somewhat in contrast with the model results of Dai and Fung (1993), which suggest climate change as a major driver of the terrestrial sink during the past century, but it is consistent with more recent model estimates that suggest a relatively small role of climate change in modulating the terrestrial sink over the past century (McGuire et al. 2001). The temporal evolution of atmospheric CO2 and Northern Hemisphere temperature in response to the reconstructed variability in solar irradiance and radiative forcing by volcanoes has been examined (Gerber et al. 2003). Modeled variations in atmospheric CO2 and Northern Hemisphere mean surface temperature are compatible with reconstructions from different Antarctic ice cores and temperature proxy data for low solar forcing. Simulations where the magnitude of solar irradiance changes is increased toward the high estimates yield a mismatch between model results and the CO2 meas urements. This finding provides further evidence for modest changes in solar irradiance and global mean temperature over the past millennium and argues against a substantial amplification of the response of global or hemispheric annual mean temperature to solar changes by the suggested cosmic ray flux—cloud cover link or other solar-related mechanisms. The results imply that solar changes are not the dominant factor in the 20th-century warming. This chapter was written while one of us (FJ) was a visitor at the National Center for Atmospheric Research (NCAR), Boulder, CO. The hospitality and generous support by Dave Schimel and NCAR's Climate and Global Dynamics Division is appreciated. We wish to thank T. Blunier, S. Harrison, N. Mahowald, E. Monnin, and N. Rosenbloom for comments on this chapter and E. Monnin for help with figures. Adams, J. M., and H. Faure. 1998. A new estimate of changing carbon storage on land since the last glacial maximum, based on global land ecosystem reconstruction. Global and Planetary Change 16/17:3—24. Alley, R. B., P U. Clark, L. D. Keigwin, and R. S. Webb. 1999. Making sense of millennial-scale climate change. Pp. 385—394 in Mechanisms of millennial-scale global climate change, edited by P. U. Clark, R. S. Webb, and L. D. Keigwin. Vol.112 of Geophysical Monograph. Washington, DC: American Geophysical Union. Ammann, B., H. Birks, S. Brooks, U. Eicher, U. Grafenstein, W. Hofmann, G. Lemdahl, J. Schwander, K. Tobolski, and L. Wick. 2000. Quantification of biotic responses to rapid climatic changes around the Younger Dryas: A synthesis. Palaeogeography, Palaeo-climatology, Palaoecology 159:313—347. Andersen, K. K., A. Armengaud, and C. Genthon. 1998. Atmospheric dust under glacial and interglacial conditions. Geophysical Research Letters 25:2281—2284. Archer, D., H. Kheshgi, and E. Maier-Reimer. 1999. Dynamics of fossil fuel CO2 neutralization by marine CaCO3. Global Biogeochemical Cycles 12:259—276. Archer, D. A., A. Winguth, D. Lea, and N. Mahowald. 2000. What caused the glacial/interglacial atmospheric pCO2 cycles? Reviews of Geophysics 38:159—189. Arrhenius, S. 1896. On the influence of carbonic acid in the air upon the temperature of the ground. The London, Edinburgh and Dublin Philosophical Magazine and Journal of Sciences 41:237—276. Baker, P A., C. A. Rigsby, G. O. Seltzer, S. C. Fritz, T. K. Lowenstein, N. P. Bacher, and C. Veliz. 2001. Tropical climate changes at millennial and orbital timescales on the Bolivian Altiplano. Nature 409:698-701. Barber, D. C., A. Dyke, C. Hillaire-Marcel, A. E. Jennings, J. T. Andrews, M. W. Kerwin, G. Bilodeau, R. McNeely, J. Southon, M. D. Morehead, and J.-M. Gagnon. 1999. Forcing of the cold event of 8,200 years ago by catastrophic drainage of Laurentide lakes. Nature 400:344-348. Bard, E., G. Raisbeck, F. Yiou, and J. Jouzel. 2000. Solar irradiance during the last 1200 years based on cosmogenic nuclides. Tellus 52B:985—992. Beer, J., F. Joos, C. Lukasczyk, W. Mende, J. Rodriguez, U. Siegenthaler, and R. Stellmacher. 1994. 10Be as an indicator of solar variability and climate. Pp. 221-223 in The solar engine and its influence on terrestrial atmosphere and climate, edited by E. Nesme-Ribes. Heidelberg: Springer Verlag. Beerling, D. J. 1999. New estimates of carbon transfer to terrestrial ecosystems between the last glacial maximum and the Holocene. Terra Nova 11:162-167. Beltrami, H. 2002. Climate from borehole data: Energy fluxes and temperatures since 1500. Geophysical Research Letters 29, doi:10.1029/2002GL015702. Bennett, K. D., and K. J. Willis. 2000. Effect of global atmospheric carbon dioxide on glacial-interglacial vegetation change. Global Ecology and Biogeography 9:355-361. Berger, A. 1978. Long-term variations of daily insolation and Quaternary climatic changes. Journal of the Atmospheric Sciences 35:2362-2367. Berger, A., and M. F. Loutre. 1991. Insolation values for the climate of the last 10 million years. Quaternary Science Reviews 10:297-317. -. 2002. An exceptionally long interglacial ahead? Science 297:1287-1288. Berger, A., M. F. Loutre, and H. Gallee. 1998. Sensitivity of the LLN climate model to the astronomical and CO2 forcings over the last 200 ky. Climate Dynamics 14: 615-629. Bird, M. I., J. Lloyd, and G. D. Farquhar. 1994. Terrestrial carbon storage at the LGM. Nature 371:566. Bond, G. C., and R. Lotti. 1995. Iceberg discharges into the North Atlantic on millennial time scales during the last glaciation. Science 267:1005-1010. Bond, G., W. S. Broecker, S. J. Johnsen, J. McManus, L. Labeyrie, J. Jouzel, and G. Bonani. 1993. Correlations between climate records from North Atlantic sediments and Greenland ice. Nature 365:143-147. Bopp, L., C. Le Quere, M. Heimann, A. C. Manning, and P. Monfray. 2002. Climate-induced oceanic oxygen fluxes: Implications for the contemporary carbon budget. Global Biogeochemical Cycles 16, doi:10.1029/2001GB001445. Bopp, L., K. E. Kohlfeld, C. Le Quere, and O. Aumont. 2003. Dust impact on marine biota and atmospheric CO2 in glacial periods. Paleoceanography 18 (2):art. no. 1046. Boyd, P A., A. J. Watson, C. S. Law, E. R. Abraham, T. Trull, R. Murdoch, D. C. E. Bakker, A. R. Bowie, K. O. B., H. Chang, M. Charette, P. Croot, K. Downing, R. F., M. Gall, M. Hadfield, J. Hall, M. Harvey, G. Jameson, J. LaRoche, M. Liddicoat, R. Ling, M. T. Maldonado, R. M. McKay, S. Nodder, S. Pickmere, R. Pridmore, S. Rintoul, K. Safi, I! Sutton, R. Strzepek, K. Tanneberger, S. Turner, A. Waite, and J. Zeldis. 2000. A mesoscale phytoplankton bloom in the polar Southern Ocean stimulated by iron fertilization. Nature 407:695-702. Broccoli, A. J., and S. Manabe. 1987. The influence of continental ice, atmospheric CO2, and land albedo on the climate of the last glacial maximum. Climate Dynamics 1:87-99. Broecker, W. S., and E. Clark. 2003. Holocene atmospheric CO2 increase as viewed from the sea floor. Global Biogeochemical Cycles 17, doi:10.1029/2002GB001985. Broecker, W. S., and G. M. Henderson. 1998. The sequence of events surrounding Termination II and their implications for the cause of glacial-interglacial CO2 changes. Paleoceanography 13:352—364. Broecker, W. S., D. M. Peteet, and D. Rind. 1985. Does the ocean-atmosphere system have more than one stable mode of operation? Nature 315:21—25. Broecker, W. S., J. Lynch-Stieglitz, E. Clark, I. Hajdas, and G. Bonani. 2001. What caused the atmosphere's CO2 content to rise during the last 8000 years? Geochemistry Geophysics Geosystems 2, art. no. 2001GC000177. Brovkin, V., M. Hofmann, J. Bendtsen, and A. Ganopolski. 2002. Ocean biology could control atmospheric S13C during glacial-interglacial cycle. Geochemistry Geophysics Geosystems 3, art. no. 1027. Bryan, F. 1986. High-latitude salinity effects and interhemispheric thermohaline circulations. Nature 323:301-304. Church, J. A., J. M. Gregory, P Huybrechts, M. Kuhn, K. Lambeck, M. T. Nhuan, D. Qin, and P. L. Woodworth. 2001. Changes in sea level. Pp. 639-693 in Climate change 2001: The scientific basis (Contribution of Working Group I to the Third Assessment Report of the Intergovernmental Panel on Climate Change), edited by J. T. Houghton, Y. Ding, D. Griggs, M. Noguer, I! van der Linden, X. Dai, K. Maskell, and C. A. Johnson. Cambridge: Cambridge University Press. Claquin, T., C. Roelandt, K. Kohfeld, S. Harrison, I. Tegen, I. Prentice, Y. Balkanski, G. Bergametti, M. Hansson, N. Mahowald, H. Rodhe, and M. Schulz. 2003. Radiative forcing of climate by ice-age atmospheric dust. Climate Dynamics 20:193-202; doi:10.1007/s00382-002-0269-1. Clark, P. U., R. A. Alley, and D. Pollard. 1999. Northern Hemisphere ice-sheet influences on global climate change. Science 286:1104-1111. Clark, P. U., N. G. Pisias, T. F. Stocker, and A. J. Weaver. 2002. The role of the thermohaline circulation in abrupt climate change. Nature 415:863-869. Crosta, X., and A. Shemesh. 2002. Reconciling down core anticorrelation of diatom carbon and nitrogen isotopic ratios from the Southern Ocean. Paleoceanography 17, art. no. 1010. Crowley, T. J. 1995. Ice age terrestrial carbon changes revisited. Global Biogeochemical Cycles 9:377-389. -. 2000. Causes of climate change of the last 1000 years. Science 289:270-277. Cubasch, U., G. A. Meehl, G. J. Boer, R. J. Stouffer, M. Dix, A. Noda, C. A. Senior, S. Raper, and K. S. Yap. 2001. Projections of future climate change. Pp. 525-582 in Climate change 2001: The scientific basis (Contribution of Working Group I to the Third Assessment Report of the Intergovernmental Panel on Climate Change), edited by J. T. Houghton, Y. Ding, D. Griggs, M. Noguer, P. van der Linden, X. Dai, K. Maskell, and C. A. Johnson. Cambridge: Cambridge University Press. Curry, W. B., J. Duplessy, L. Labeyrie, and N. J. Shackleton. 1988. Changes in the distribution of S13C of deepwater SCO2 between the last glaciation and the Holocene. Paleoceanography 3:317-341. Dai, A., and I. Y. Fung. 1993. Can climate variability contribute to the "missing" CO2 sink? Global Biogeochemical Cycles 7:599-609. Dansgaard, W., H. B. Clausen, N. Gundestrup, C. U. Hammer, S. F. Johnsen, P. M. Kristinsdottir, and N. Reeh. 1982. A new Greenland deep ice core. Science 218: 1273-1277. Delaygue, G., T. F. Stocker, F. Joos, and G.-K. Plattner. 2003. Simulation of atmospheric radiocarbon during abrupt oceanic circulation changes: Trying to reconcile models and reconstructions. Quaternary Science Reviews 22:1647—1658. DeLucia, E. H., J. G. Hamilton, S. L. Naidu, R. B. Thomas, J. A. Andrews, A. Finzi, M. Lavine, R. Matamala, J. E. Mohan, G. R. Hedrey, and W. H. Schlesinger. 1999. Net primary production of a forest ecosystem with experimental CO2 enrichment. Nature 284:1177-1179. Ding, Z. L., J. Z. Ren, S. L. Yang, and T. S. Liu. 1999. Climate instability during the penultimate glaciation: Evidence from two high- resolution loess records, China. Journal of Geophysical Research 104:20123-20132. Duplessy, J. C., N. J. Shackleton, R. G. Fairbanks, L. Labeyrie, D. Oppo, and N. Kallel. 1988. Deepwater source variations during the last climate cycle and their impact on the global deepwater circulation. Paleoceanography 3:343-360. Eicher, U., U. Siegenthaler, and S. Wegmuller. 1981. Pollen and isotope analysis on late and post-glacial sediments of the Tourbiere de Chirens (Dauphine, France). Quaternary Research 15:160-170. Esper, J., E. R. Cook, and F. H. Schweingruber. 2002. Low-frequency signals in long tree-ring chronologies for reconstructing past temperature variability. Science 295:22502253. Esser, G., and M. Lautenschlager. 1994. Estimating the change of carbon in the terrestrial biosphere from 18000 BP to present using a carbon cycle model. Environmental Pollution 83:45-53. Fluckiger, J., A. Dallenbach, T. Blunier, B. Stauffer, T. F. Stocker, D. Raynaud, and J.-M. Barnola. 1999. Variations in atmospheric N2O concentrations during abrupt climatic changes. Science 285:227-230. Fluckiger, J., E. Monnin, B. Stauffer, J. Schwander, T. F. Stocker, J. Chappellaz, D. Raynaud, and J.-M. Barnola. 2002. High resolution Holocene N2O ice core record and its relationship with CH4 and CO2. GlobalBiogeochemical Cycles 16, doi:10.1029/ 2001GB001417. Francois, R., M. A. Altabet, E. Yu, D. M. Sigman, M. P. Bacon, M. Frank, G. Bohrmann, G. Bareille, and L. D. Labeyrie. 1998. Contribution of Southern Ocean surface water stratification to low atmospheric CO2 concentrations during the last glacial period. Nature 389:929-935. François, L. M., Y. Goddéris, P. Warnant, G. Ramstein, N. de Noblet, and S. Lorenz. 1999. Carbon stocks and isotopic budgets of the terrestrial biosphere at mid-Holocene and last glacial maximum times. Chemical Geology 159:163-189. Gallée, H., J. P. Van Ypersele, T. F. I. Marsiat, C. Tricot, and A. Berger. 1992. Simulation of the last glacial cycle by a coupled, sectorially averaged climate-ice sheet model. 2. Response to insolation and CO2 variations. Journal of Geophysical Research 97:151713151740. Ganopolski, A., S. Rahmstorf, V. Petoukhov, and M. Claussen. 1998. Simulation of modern and glacial climates with a coupled global model of intermediate complexity. Nature 391:351-356. Gerber, S., F. Joos, P. P Brugger, T. F. Stocker, M. E. Mann, S. Sitch, and M. Scholze. 2003. Constraining temperature variations over the last millennium by comparing simulated and observed atmospheric CO2. Climate Dynamics 20:281 -299. Goldstein B., F. Joos, and T. F. Stocker. 2003. A modeling study of oceanic nitrous oxide during the Younger Dryas cold period. Geophysical Research Letters 30, doi:10.1029/2002/GL0164l8. Hays, J. D., J. Imbrie, and N. J. Shackleton. 1976. 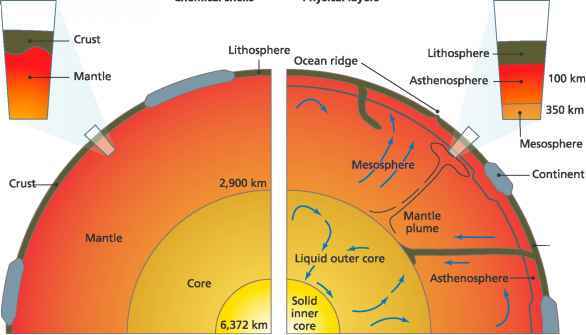 Variations in the Earth's orbit: Pacemaker of the ice ages. Science 194:1121 — 1132. Hewitt, C. D., and J. F. B. Mitchell. 1997. Radiative forcing and response of a GCM to ice age boundary conditions: Cloud feedback and climate sensitivity. Climate Dynamics 13:821-834. Hewitt, C. D., R. J. Stouffer, A. J. Broccoli, J. F. B. Mitchell, and P. J. Valdes. 2003. The effect of ocean dynamics in a coupled GCM simulation of the Last Glacial Maximum. Climate Dynamics 20:203-218; doi:10.1007/s00382-002-0272-6. Houghton, J. T., Y. Ding, D. Griggs, M. Noguer, P. van der Linden, X. Dai, K. Maskell, and C. A. Johnson, eds. 2001. Climate change 2001: The scientific basis (Contribution of Working Group I to the Third Assessment Report of the Intergovernmental Panel on Climate Change). Cambridge: Cambridge University Press. Hoyt, D. V, and K. H. Schatten. 1994. The one hundredth year of Rudolf Wolf's death: Do we have the correct reconstruction of solar activity? Geophysical Research Letters 21:2067-2070. Huang, S., H. N. Pollack, and P. Shen. 2000. Temperature trends over the past five centuries reconstructed from borehole temperatures. Nature 403:756-758. Hughen, K. A., J. R. Southon, S. J. Lehman, and J. T. Overpeck. 2000. Synchronous radiocarbon and climate shifts during the last deglaciation. Science 290:1951 -1954. Indermuhle, A., T. F. Stocker, F. Joos, H. Fischer, H. Smith, M. Wahlen, B. Deck, D. Mastroianni, J. Tschumi, T. Blunier, R. Meyer, and B. Stauffer. 1999. Holocene carbon-cycle dynamics based on CO2 trapped in ice at Taylor Dome, Antarctica. Nature 398:121-126. Indermuhle, A., E. Monnin, B. Stauffer, T. F. Stocker, and M. Wahlen. 2000. 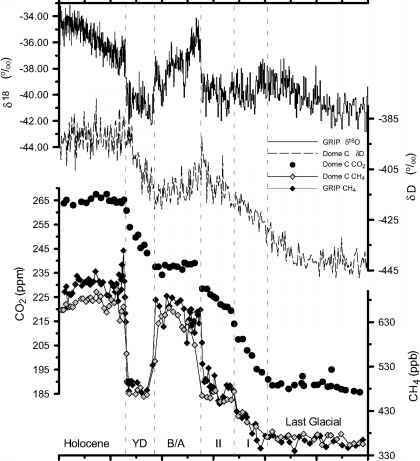 Atmospheric CO2 concentration from 60 to 20 kyr BP from the Taylor Dome ice core, Antarctica. Geophysical Research Letters 27:735-738. Jones, P D., K. R. Briffa, T. P. Barnett, and S. F. B. Tett. 1998. High-resolution palaeocli-matic records for the last millennium: Interpretation integration and comparison with General Circulation Model control-run temperatures. The Holocene 8:455-471. Joos, F., and M. Bruno. 1998. Long-term variability of the terrestrial and oceanic carbon sinks and the budgets of the carbon isotopes 13C and 14C. Global Biogeochemical Cycles 12:277-295. Joos, F., I. C. Prentice, S. Sitch, R. Meyer, G. Hooss, G.-K. Plattner, S. Gerber, and K. Hasselmann. 2001. Global warming feedbacks on terrestrial carbon uptake under the Intergovernmental Panel on Climate Change (IPCC) emission scenarios. Global Biogeochemical Cycles 15:891-907. Joos, F., S. Gerber, I. C. Prentice, B. Otto-Bliesner, and I! Valdes. 2003a. Transient simulations of Holocene atmospheric carbon dioxide and terrestrial carbon since the Last Glacial Maximum. Global Biogeochemical Cycles (submitted). Joos, F., G.-K. Plattner, T. F. Stocker, A. Kortzinger, and D. W. R. Wallace. 2003b. Trends in marine dissolved oxygen: Implications for ocean circulation changes and the carbon budget. Eos, Transactions, American Geophysical Union, 84:197-201. Kaplan, J. O., I. C. Prentice, W. Knorr, and P. J. Valdes. 2002. Modeling the dynamics of terrestrial carbon storage since the Last Glacial Maximum. Geophysical Research Letters 29, doi:10.1029/2002GL015230. Kawamura, K., T. Nakazawa, S. Aoki, S. Sugawara, Y. Fujii, and O. Watanbe. 2003. Atmospheric CO2 variations over the last three glacial-interglacial climatic cycles deduced from the Dome Fuji deep ice core, Antarctica, using a wet extraction technique. Tellus 55B:126-137. Keeling, R. F., and H. Garcia. 2002. The change in oceanic O2 inventory associated with recent global warming. Proceedings of the National Academy of Sciences of the USA 99:7848-7853. Keeling, R. F., and S. R. Shertz. 1992. Seasonal and interannual variations in atmospheric oxygen and implications for the global carbon cycle. Nature 358:723-727. Kim, S. J., G. M. Flato, G. J. Boer, and N. A. McFarlane. 2002. A coupled climate model simulation of the Last Glacial Maximum. 1. Transient multi-decadal response. Climate Dynamics 19:515-537. Kitoh, A., S. Murakami, and H. Koide. 2001. A simulation of Last Glacial Maximum with a coupled atmosphere-ocean GCM. Geophysical Research Letters 28:2221-2224. Knorr, G., and G. Lohmann. 2003. Southern Ocean origin for the resumption of the Atlantic thermohaline circulation during deglaciation. Nature 424:532-536. Knox, F., and M. McElroy. 1984. Change in atmospheric CO2: Influence of the marine biota at high latitude. Journal of Geophysical Research 89:4629-4637. Knutti, R., and T. F. Stocker. 2002. Limited predictability of the future thermohaline circulation close to an instability threshold. Journal of Climate 30:179-186. Lang, C., M. Leuenberger, J. Schwander, and S. Johnsen. 1999. 16°C rapid temperature variation in Central Greenland 70,000 years ago. Science 286:934-937. Lean, J., J. Beer, and R. Bradley. 1995. Reconstruction of solar irradiance since 1610: Implication for climate change. Geophysical Research Letters 22:3195-3198. Levevre, N., and A. J. Watson. 1999. Modeling the geochemical cycle of iron in the oceans and its impact on atmospheric CO2 concentrations. Global Biogeochemical Cycles 13:727-736. Levis, S., J. A. Foley, and D. Pollard. 1999. CO2, climate, and vegetation feedbacks at the Last Glacial Maximum. Journal of Geophysical Research 104:31191-31198. Loutre, M. F., and A. Berger. 2000. Future climate changes: Are we entering an exceptionally long interglacial? Climatic Change 46:611-90. Luo, Y., J. Reynolds, and Y. Wang. 1999. A search for predictive understanding of plant responses to elevated CO2. Global Change Biology 5:143-156. Mahowald, N., K. E. Kohlfeld, M. Hansson, Y. Balkanski, S. P. Harrison, I. C. Prentice, M. Schulz, and H. Rhode. 1999. Dust sources and deposition during the Last Glacial Maximum and current climate: A comparison of model results with paleodata from ice cores and marine sediments. Journal of Geophysical Research 104:15895-15816. Mann, M. E., R. S. Bradley, and M. K. Hughes. 1999. Northern Hemisphere temperatures during the past millennium: Inferences, uncertainties, and limitations. Geophysical Research Letters 26:759-762. Marchal, O., T. F. Stocker, and F. Joos. 1999a. On large-scale physical and biogeochemical responses to abrupt changes in the Atlantic thermohaline circulation. Pp. 263-284 in Mechanisms of millennial-scale global climate change, edited by P. U. Clark, R. S.
Webb, and L. D. Keigwin. Vol. 112 of Geophysical Monograph. Washington, DC: American Geophysical Union. Marchal, O., T. F. Stocker, F. Joos, A. Indermühle, T. Blunier, and J. Tschumi. 1999b. Modelling the concentration of atmospheric CO2 during the Younger Dryas climate event. Climate Dynamics 15:341—354. Marchal, O., T. F. Stocker, and R. Muscheler. 2001. Atmospheric radiocarbon during the Younger Dryas: Production, ventilation, or both? Earth and Planetary Science Letters 185:383-395. Martin, J. H., K. H. Coale, K. S. Johnson, S. E. Fitzwater, R. M. Gordon, S. J. Tanner, C. N. Hunter, V A. Elrod, J. L. Nowicki, T. L. Coley, R. T. Barber, S. Lindley, A. J. Watson, K. V Scoy, C. S. Law, M. I. Liddicoat, R. Ling, T. Stanton, J. Stockel, C. Collins, A. Anderson, R. Bidigare, M. Ondrusek, M. Latasa, F. J. Millero, K. Lee, W. Yao, J. Y. Zhang, G. Friederich, C. Sakamoto, F. Chavez, K. Buck, Z. Kolber, R. Greene, P. Falkowski, S. W. Chisholm, F. Hoge, R. Swift, J. Yungel, S. Turner, P Nightingale, A. Hatton, P Liss, and N. W. Tindale. 1994. Testing the iron hypothesis in ecosystems of the equatorial Pacific Ocean. Nature 371:123-129. McGuire, A. D., S. Sitch, J. S. Clein, R. Dargaville, G. Esser, J. Foley, M. Heimann, F. Joos, J. Kaplan, D. W. Kicklighter, R. A. Meier, J. M. Melillo, B. Moore. III, I. C. Prentice, N. Ramankutty, T. Reichenau, A. Schloss, H. Tian, L. J. Williams, and U. Wittenberg. 2001. Carbon balance of the terrestrial biosphere in the twentieth century: Analyses of CO2, climate and land-use effects with four process-based ecosystem models. Global Biogeochemical Cycles 15:183-206. Mikolajewicz, U. 1996. A meltwater-inducedcollapse of the "conveyor belt" thermohaline circulation and its influence on the distribution of 814C and 818O in the oceans. Technical Report 189. Hamburg: Max-Planck-Institut für Meteorologie. Monnin, E., A. Indermühle, A. Däallenbach, J. Flückiger, B. Stauffer, T. F. Stocker, D. Raynaud, and J. Barnola. 2001. Atmospheric CO2 concentrations over the last glacial termination. Science 291:112-114. Morgan, V., M. Delmotte, T. van Ommen, J. Jouzel, J. Chapellaz, S. Woon, V Masson-Delmotte, and D. Raynau. 2002. Relative timing of deglacial climate events in Antarctica and Greenland. Science 297:1862-1865. Muscheler, R., J. Beer, G. Wagner, and R. C. Finkel. 2000. Changes in deep-water formation during the Younger Dryas event inferred from 10Be and 14C records. Nature 408:567-570. Oeschger, H., J. Beer, U. Siegenthaler, and B. Stauffer. 1984. Late glacial climate history from ice cores. Pp. 299-306 in Climate processes and climate sensitivity, edited by J. E. Hansen and T. Takahashi. Vol. 29 of Geophysical Monograph. Washington, DC: American Geophysical Union. Peng, C. H., J. Guiot, and E. Van Campo. 1998. Estimating changes in terrestrial vegetation and carbon storage: Using palaeoecological data and models. Quaternary Science Reviews 17:719-735. Petit, J. R., J. Jouzel, D. Raynaud, N. I. Barkov, J.-M. Barnola, I. Basile, M. Bender, J. Chappellaz, M. Davis, G. Delaygue, M. Delmotte, V. M. Kotlyakov, M. Legrand, V. Y. Lipenkov, C. Lorius, L. Pépin, C. Ritz, E. Saltzman, and M. Stievenard. 1999. Climate and atmospheric history of the past 420,000 years from the Vostok ice core, Antarctica. Nature 399:429-436. Plattner, G.-K., F. Joos, T. F. Stocker, and O. Marchal. 2001. Feedback mechanisms and sensitivities of ocean carbon uptake under global warming. Tellus 53B:564—592. Plattner, G.-K., F. Joos, and T. F. Stocker. 2002. Revision of the global carbon budget due to changing air-sea oxygen fluxes. GlobalBiogeochemical Cycles 16:1096, doi:10.1029/2001GB001746. Porter, S. C. 2001. Chinese loess record of monsoon climate during the last glacial-interglacial cycle. Earth Science Reviews 54:115 — 128. Prentice, I. C., G. D. Farquhar, M. J. Fasham, M. I. Goulden, M. Heimann, V. J. Jaramillo, H. S. Kheshgi, C. LeQuéré, R. J. Scholes, and D. W. R. Wallace. 2001. The carbon cycle and atmospheric CO2. Pp. 183—237 in Climate change 2001: The scientific basis (Contribution of Working Group I to the Third Assessment Report of the Intergovernmental Panel on Climate Change), edited by J. T. Houghton, Y. Ding, D. Griggs, M. Noguer, P van der Linden, X. Dai, K. Maskell, and C. A. Johnson. Cambridge: Cambridge University Press. Prokopenko, A. A., D. F. Williams, E. B. Karabanov, and G. K. Khursevich. 2001. Continental response to Heinrich events and Bond cycles in sedimentary record of Lake Baikal, Siberia. Global and Planetary Change 28:217—226. Reid, G. C. 1997. Solar forcing and global climate change since the mid-17th century. Climatic Change 37:391-405. Rothlisberger, R., R. Mulvaney, E. W. Wolff, M. Hutterli, M. Bigler, S. Sommer, and J. Jouzel. 2002. Dust and sea salt variability in central East Antarctica (Dome C) over the last 45 kyrs and its implications for southern high-latitude climate. Geophysical Research Letters 29, doi:10.1029/2002GL015186. Rousseau, D. D., P. Antoine, C. Hatte, A. Lang, L. Zoller, M. Fontugne, D. Ben Othman, J. M. Luck, O. Moine, M. Labonne, I. Bentaleb, and D. Jolly. 2002. Abrupt millennial climatic changes from Nussloch (Germany) upper Weichselian eolian records during the last glaciation. Quaternary Science Reviews 21:1577-1582. Ruddiman, W. F., and A. McIntyre. 1981. The North Atlantic Ocean during the last glaciation. Palaeogeography, Palaeoclimatology, Palaoecology 35:145-214. Sánchez Goñi, M. F., J. Turon, F. Eynaud, and S. Gendreau. 2000. European climatic response to millennial-scale changes in the atmosphere-ocean system during the last glacial period. Quaternary Research 54:394-403. Sánchez Goñi, M. F., I. Cacho, J. Turon, J. Guiot, F. J. Sierro, J. Peypouquet, J. Grimalt, and N. J. Shackleton. 2002. Sinchroneity between marine and terrestrial responses to millennial scale climatic variability during the last glacial period in the Mediterranean region. Climate Dynamics 19:95-105. Sarmiento, J. L., and R. Toggweiler. 1984. A new model for the role of the oceans in determining atmospheric pCO2. Nature 308:621 -624. Sarnthein, M., K. Winn, S. J. A. Jung, J. C. Duplessy, L. Labeyrie, H. Erlenkeuser, and G. Ganssen. 1994. Changes in East Atlantic deepwater circulation over the last 30,000 years: Eight time slice reconstruction. Paleoceanography 99:209-268. Schmittner, A., M. Yoshimori, and A. J. Weaver. 2002. Instability of glacial climate in a model of ocean-atmosphere-cryosphere system. Science 295:1489-1493. Scholze, M., W. Knorr, and M. Heimann. 2003. Modelling terrestrial vegetation dynamics and carbon cycling for an abrupt climate change event. The Holocene 13:319-326. Schwander, J., T. Sowers, J. Barnola, T. Blunier, B. Malaizé, and A. Fuchs. 1997. Age scale of the air in the summit ice: Implication for glacial-interglacial temperature change. Journal ofGeophysical Research 102:19483-19494. Severinghaus, J. P., and E. J. Brook. 1999. Abrupt climate change at the end of the last glacial period inferred from trapped air in polar ice. Science 286:930-934. Severinghaus, J. P., T. Sowers, E. J. Brook, R. B. Alley, and M. L. Bender. 1998. Timing of abrupt climate change at the end of the Younger Dryas interval from thermally fractionated gases in polar ice. Nature 391:141 -146. Shackleton, N. J. 1977. Carbon-13 in Uvigerina: Tropical rainforest history and the equatorial Pacific carbonate dissolution cycles. Pp. 401-428 in The fate of fossil fuel CO2 in the ocean, edited by N. R. Andersen and A. Malahoff. New York: Plenum. -. 2000. The 100,000-year ice-age cycle identified and found to lag temperature, carbon dioxide, and orbital eccentricity. Science 289:1897-1902. Shaviv, N. J., and J. Veizer. 2003. Celestial driver of Phanerozoic climate? GSA Today 13:4-10. Shin, S., Z. Liu, B. Otto-Bliesner, E. C. Brady, J. E. Kutzbach, and S. P. Harrison. 2003. A simulation of the Last Glacial Maximum climate using the NCAR-CCSM. Climate Dynamics 20:127-151; doi:10.1007/s00382-002-0260-x. Sigman, D. M., and E. A. Boyle. 2000. Glacial/interglacial variations in atmospheric carbon dioxide. Nature 407:859-869. Sitch, S., B. Smith, I. C. Prentice, A. Arneth, A. Bondeau, W. Cramer, J. O. Kaplan, S. Levis, W. Lucht, M. Sykes, K. Thonicke, and S. Venevsky. 2003. Evaluation of ecosystem dynamics, plant geography and terrestrial carbon cycling in the LPJ dynamic global vegetation model. Global Change Biology 9:161-185. Stauffer, B., T. Blunier, A. Dallenbach, A. Indermuhle, J. Schwander, T. F. Stocker, J. Tschumi, J. Chappellaz, D. Raynaud, C. U. Hammer, and H. B. Clausen. 1998. Atmospheric CO2 and millennial-scale climate change during the last glacial period. Nature 392:59-62. Stauffer, B., J. Fluckiger, E. Monnin, J. Schwander, J.-M. Barnola, and J. Chappellaz. 2002. Atmospheric CO2, CH4 and N2O records over the past 60,000 years based on the comparison of different polar ice cores. Annals of Glaciology 35:202-208. Stephens, B. B., and R. F. Keeling. 2000. The influence of Antarctic sea ice on glacial-interglacial CO2 variations. Nature 404:171-174. Stocker, T. F. 2000. Past and future reorganisations in the climate system. Quaternary Science Reviews 19:301-319.